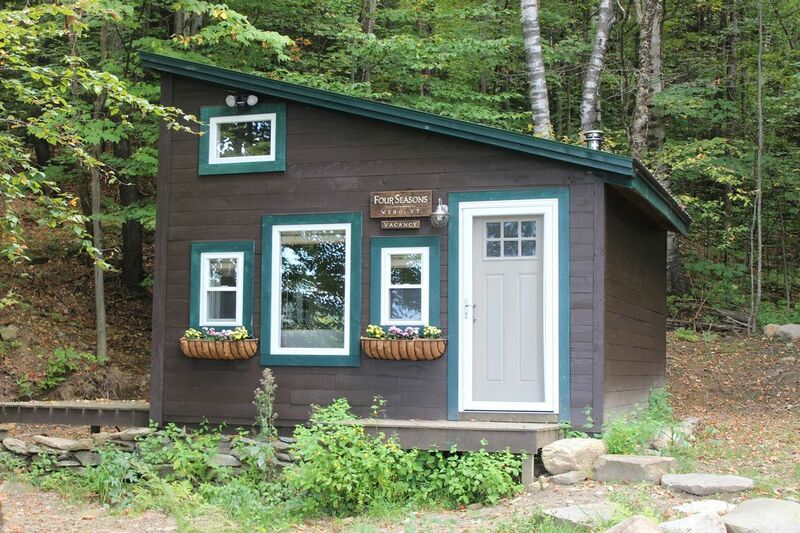 Be our guest in this newly renovated 225 sq ft tiny house cabin nestled in the Green Mountains. The Four Seasons has all the comforts of home with the calm and quiet of the mountains. Enjoy the beautiful sunset views from the deck or while keeping warm in front of the wood stove. We are minutes from the Long Trail, rock climbing, swimming holes, and golf, and less than a 45 minute drive to Burlington and most ski areas. Located about 80 miles from here, Montreal is also close enough for a day trip! Please be aware that we are located about 4 miles down a dirt road and up a long driveway that has steep sections. A 4 wheel drive vehicle may be necessary at times to get to the top. In certain winter circumstances, you may be required to park in a lower lot and walk up to the tiny house. Advance notice will be given in those instances. There is a full bathroom with a stand up shower. We are located about 4 miles down a dirt road and up about a .25 mile driveway. A 4 wheel drive vehicle may be necessary during the winter months to access our driveway. Additional electric heat is available if you don't feel comfortable with a wood stove. Parking is available about 30 yards from the cabin. In winter months you may have to park in a lower lot and walk up a portion of the driveway. Advanced notice will be given in those situations. We will provide wood and all necessary tools. This is a one room cabin but has a living room area with a couch. Our kitchen is stocked with the cooking and dining essentials. Feel free to use anything you find including coffee, tea and spices. We have a Sonos that you can either plug in to or you can use the app. We are under an hour to Stowe Mountain Resort, Bolton Valley, Sugarbush, and Smugglers Notch. The West Bolton Golf Course is right across the street! This is an absolutely charming cabin in the woods and so beautifully cared for. Thank you for a lovely holiday get-away. The tiny house had everything we needed. I miss it already and plan on returning. We had a wonderful weekend! So cozy and there was plenty to do! Would definitely come back!